I want to start of with the fact that I was expecting this book to be for a younger audience based on the cheesy title and the childish cover, however once I started reading it, I realised that it is certainly intended for a teen audience primarily due to the large amount of sexual references (non graphic). I have to admit that I found this rather refreshing, as many authors try to downplay the heightened hormones of teenagers, however I think that it was a useful tool in creating the confused and traumatized character of Dan. 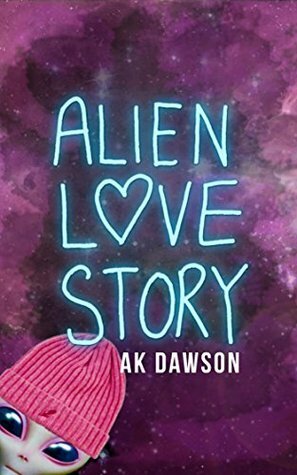 I thought that the romance was out of the blue, and not really all that romantic but simply awkward which is why it took me a while to get through this book because I just couldn’t connect with the characters as their relationship was so unnatural, but then again we are talking about a human and an alien so perhaps that is too be expected. I must say that I thoroughly enjoyed the first half of the book and found it amusing and entertaining, however the second half was a tad confusing and it seemed like this novel has a lot of potential to be excellent but that it has just been a little rushed. I adored the secondary characters of Gran and Tony and thought they added a sense of reality to the story. Of Course this book also deals with the topic matter of death and as an audience we feel sorry for Dan, however I think that the theme of loss could have been explored in more detail however I did enjoy the fact that as an audience we were forced to question Dan’s sanity. Overall, this was a quick and entertaining read.